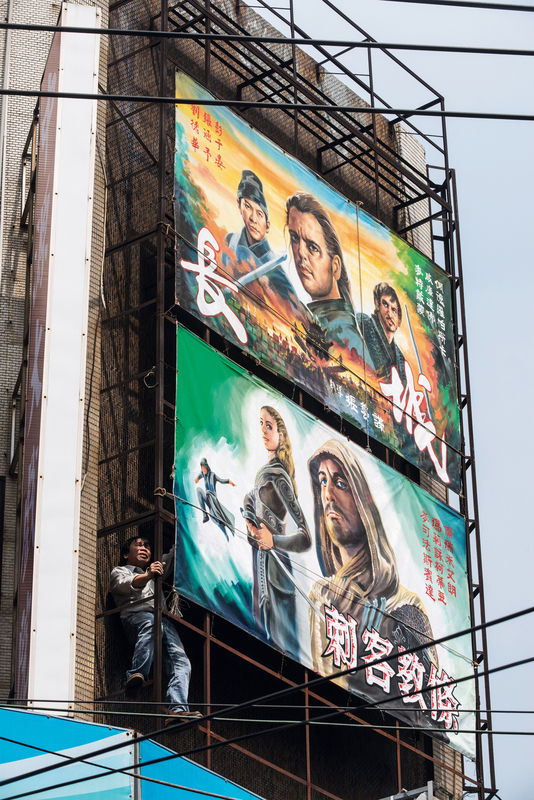 When advertising began in February for the Hollywood film Logan, the portrait of the central character “Professor X” executed by Yan Jhen-fa, master artist for the ­Chuan Mei Theater in Tai­nan, stood out as a brilliant example of Taiwan’s tradition of hand-painted movie billboards. 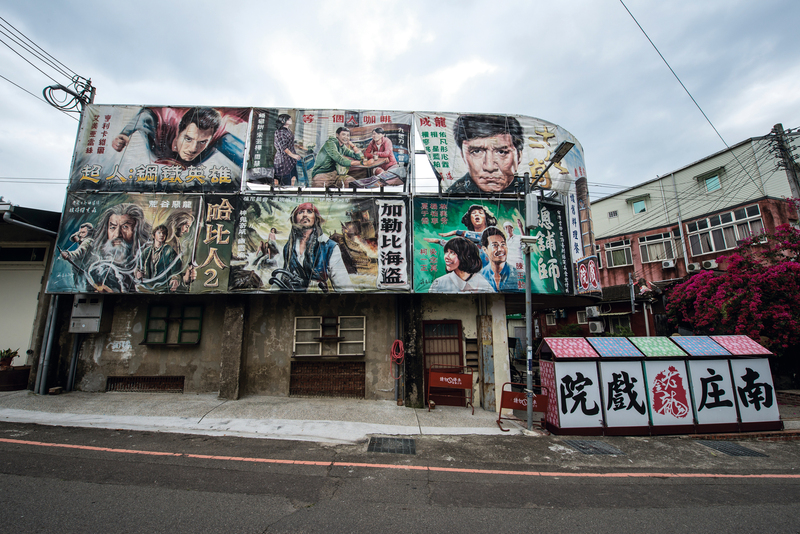 Meanwhile in northern Taiwan another maestro of cinema billboards, known as “Mo­ri­yama,” has continued to use his refined skills to bring the latest feature films vividly to life. 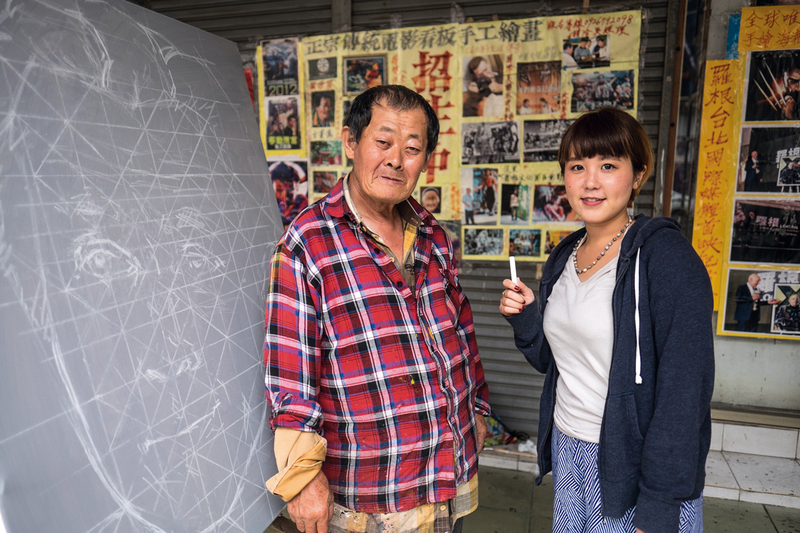 These two national treasures have spent their lives perpetuating Taiwan’s long­standing cultural tradition of hand-crafted film billboards. 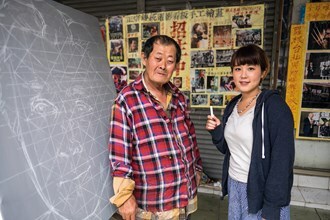 In a tranquil alleyway off Zhong­shan East Road in Tao­yuan’s ­Zhongli District, billboard artist Hsieh Sen-shan, better known by his Japanese name “Mo­ri­yama” (or “Mori”), stands on a stool, using a ballpoint pen to draw a grid on a poster for the movie Moana (2016). Then, holding his oil paints in one hand and using the grid as a guide, he paints the giant fishhook that the character Maui holds in his hand. With just a few simple strokes, Moriyama can instantly evoke a blue sky and floating clouds. Moriyama, who is in the habit of signing each of his works, says that his most popular billboards are the ones he has done for movies starring the actor and variety-show host Chu Ko-­liang. He says he gets orders in advance for each and every one. He unrolls his only remaining example, a poster for David Loman 2 (2016) that he keeps around for educational purposes and for exhibitions. Chu’s features stand out prominently, as do his highly expressive wrinkles, which have deepened with age. 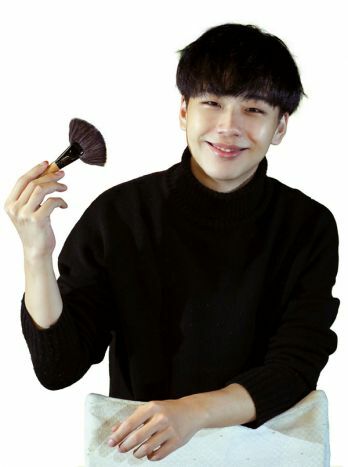 And of course the image captures Chu’s signature “bowl cut” hairstyle. “For the image to really resemble the subject, you have to capture the essence of the person, the spirit. If you do, then the result is more true to life than any movie poster printed out from a computer. It’s as if Chu is really looking at you or talking with you,” says Mori. Moriyama, who grew up in a poor family, says, “If you have a skill, you’ll never go hungry.” With this in mind, and hoping to help support his family, he entered his profession at age 15, completed his apprenticeship at 17, and promised himself that he would strike out as a “master” on his own even before doing his military service. The calligraphic style used in this poster for the well-known Japanese anime film Your Name (2016) was based on a work by Moriyama. But learning to be an artist is no mean feat. The masters to whom Mori was at first apprenticed mainly made him do menial tasks, and the only way he could learn anything was by quietly observing on the sly. When everyone else went home, he stayed behind by himself, practicing again and again the portraits that the master had painted that day, using leftover paints that had not yet dried out to learn how to mix colors. Although he was often scolded for working into the wee hours of the night, he didn’t give up. 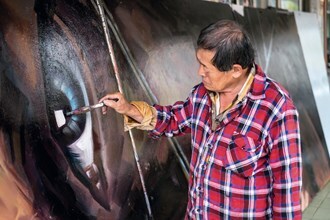 There were also nights when he rode his bike all the way from Tao­yuan to Tai­pei’s Xi­men­ding cinema district just to examine the hand-painted movie billboards, going so far as to closely study the brushwork by flashlight. He recalls that he had to pass through a ­bamboo forest on his way home, and the spooky sound of the wind through the bamboo terrified him so much that he cried as he rode. Although he thought about giving up, Mo­ri­yama—who never had any formal academic training—stuck to his hardscrabble self-training, and survived every challenge to finally become a master billboard painter himself. 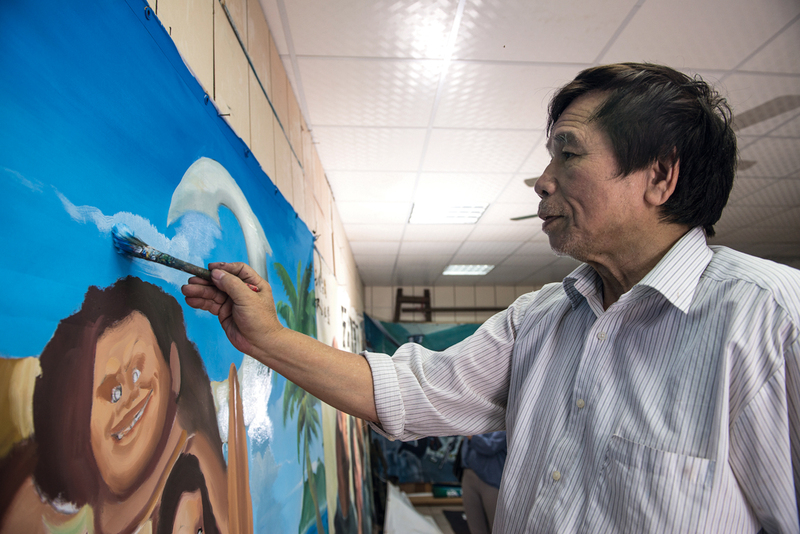 Now aged 72, Mo­ri­yama still paints billboards for the Zhong­yuan Grand Theater in ­Zhongli, and in fact these “retro” relics of another era have become a signature attraction at the theater. It is still the responsibility of the artist—even one in his 70s—to change out the old billboards and install the new. Mo­ri­yama clambers up in the space between the ­theater’s facade and the metal framework that supports the billboards, and, with a practiced hand, tears down the old work and installs the new, which his family members lower to him on a rope. Observers can’t help but break into a cold sweat, but Mori assures us that it’s actually “very safe.” Self-deprecatingly describing himself as a “laborer,” he admits that whereas in the old days he could replace billboards single­handedly without even breathing hard, in recent years he has found himself gasping for air just climbing up. He periodically declares that he wants to retire, but then he gets that old itch again and out come the brushes and pigments. Nearby ­Chung Yuan Christian University has hosted an exhibition of Mo­ri­yama’s art, and besides purchasing two works for the university’s permanent collection, has also invited him to speak at the school to share his life experiences with students. He always has a full calendar each year at graduation time as many students seek him out. Always smiling and modest, he never fails to put aside his own work to answer questions and assist students to finish their assignments. The Chuan Mei Theater has started up a course in hand painting of movie posters and billboards, taught personally and in a hands-on style by national treasure Yan Jhen-fa. Chiaki Ito, a young Japanese woman who caught the eye of the Taiwanese public by doing a circumambulation of Taiwan last year, has come back to study under Yan Jhen-fa. Meanwhile, over at Tai­nan’s ­Chuan Mei Theater, Yan Jhen-fa, though of an age with Mo­ri­yama, has a markedly different style, and prefers to work with oil-painting canvases or wooden boards for his movie posters, whereas Mo­ri­ works mainly on canvas sailcloth. What they have in common, however, is the hard road they had to follow and the perseverance they showed when learning their craft. 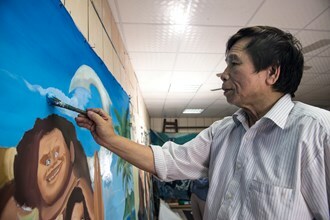 Yan faced opposition from his family over his decision to pursue painting. “But I wanted to learn a skill, otherwise I would have starved,” he says. The ­Chuan Mei Theater, which has partnered with Master Yan for a long time, has in recent years started up a “billboard cultural and creative camp,” with Yan as chief instructor, where the curriculum starts from the very basics. 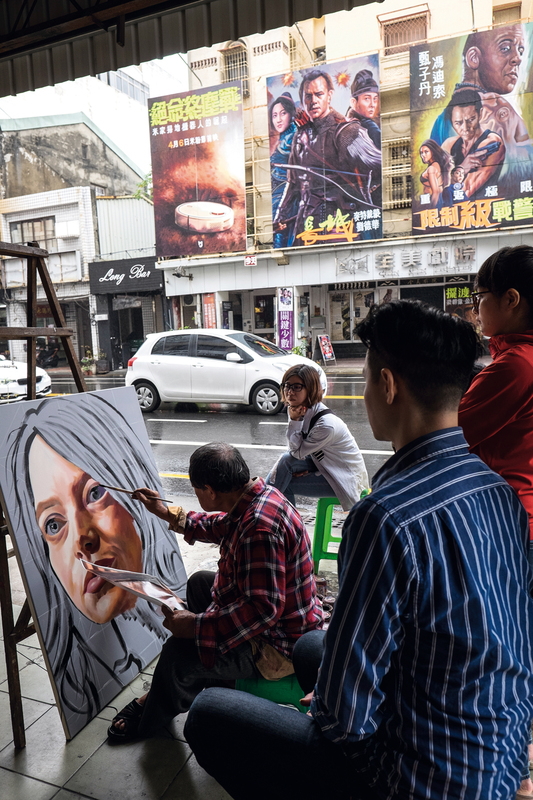 Chiaki Ito, a Japanese woman who gained a measure of renown in Taiwan by doing a 72-day walking tour of the island last year, was captivated by the movie billboards as she passed by the ­Chuan Mei Theater. She came back to Taiwan this year, and asked Yan to take her on as a pupil on weekends and teach her his craft. 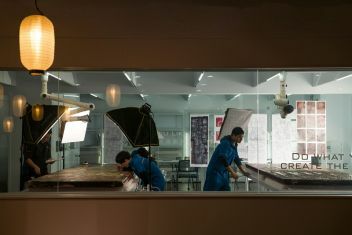 When Ito gets hung up on how to capture a person’s features on a billboard, Yan walks to her side and, ruler in hand, compares her work surface to the poster. He demands that she draw the grid more clearly, so that the lines on the poster and the painted billboard will be identical. Only then will she be able to draw the correct outline and shape of the face, and from there delineate the features. Yan walks around, standing next to each student in turn, and instructs them with real attention to detail. His voice rings out as he says again and again, “You have to capture the form and structure; every stroke has to be clear; you have to use your brain to think, and observe carefully.” Everyone has facial features, but each person has their own defining characteristics, so you have to account for every brush stroke. You can’t just paint blindly, because once the unique characteristics disappear you will not have a true likeness. Yan Jhen-fa proudly poses with his hand-painted billboard for the film Doctor Strange (2016). Yan, who has spent a lifetime steeped in handcrafted art, has in recent years been afflicted with detached retinas, but still he won’t give up on this creative work that he loves. With the nature of an artist and rather ta­cit­urn, Yan has never stopped learning himself, and every new cinema idol on every new poster is a chance to innovate and learn. 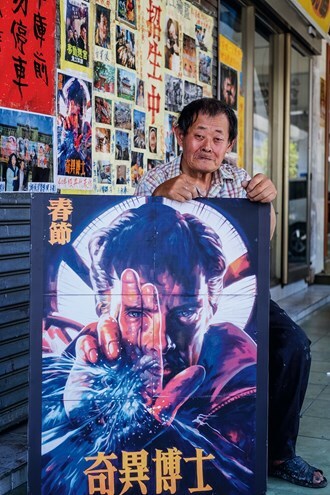 Yan brings out from his workshop a piece he produced last year for the film Doctor Strange. He says with satisfaction, “This was a challenge of the highest level of difficulty. It’s a distillation of everything I’ve learned in my life.” The painting looks even cooler than the poster, and Yan considers it one of his master works, representative of his philosophy of capturing the “core essence” and bringing out the mobility and three-dimension­ality of the facial features. The course started by Yan and the ­Chuan Mei Theater now has several regular students. But these acolytes are still far from being ready to strike out on their own, and their performance still falls well short of Yan’s strict demands. Wu ­Haoze has been studying with Yan for three years. When he first started out studying oil painting he couldn’t do anything right, and he is still working to master Yan’s style and painting techniques. He frequently acts as Yan’s assistant, doing odd jobs and menial tasks while he humbly awaits the day of enlightenment when he grasps Yan’s idea of the “core essence” and can himself produce the quality of work seen in the Doctor Strange poster. Yan, who has spent a lifetime steeped in handcrafted art, has in recent years been afflicted with detached retinas, but still he won’t give up on this creative work that he loves, and has no time to rest. 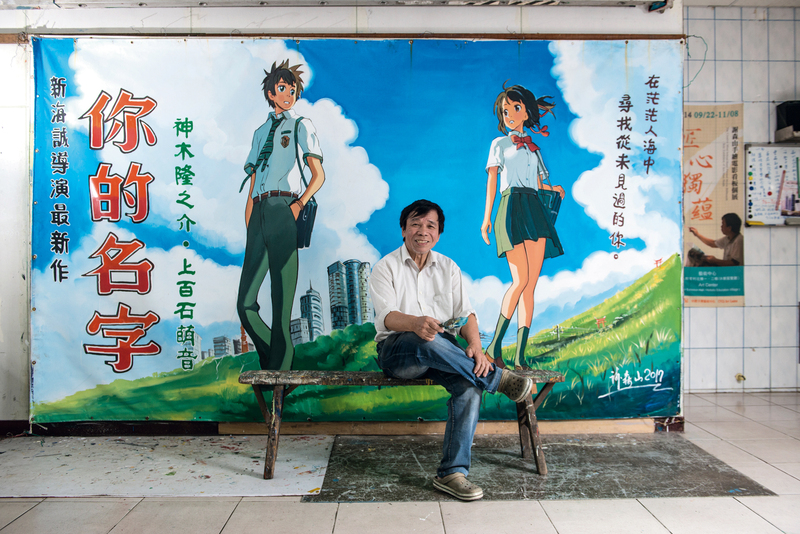 As he has never married, Yan sees painting as his lifetime partner, and although it can be said that movie billboards are based on posters, there is still plenty of room for creativity and innovation. In his spare time, Yan studies oil painting, and he has even done a self-portrait in the manner of Van Gogh. It’s a great outlet for him. 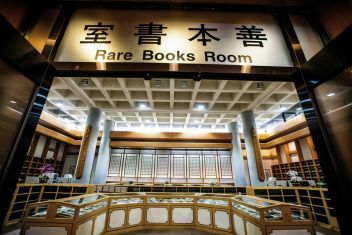 Seeing how well his works are being received today, Yan feels thrilled, but in his usual self-effacing manner he gives all the credit to his teacher, Chen Feng­yong. The advent of printing technology changed human civilization, and in recent times computer-printed movie posters have had a major impact on one of the most cherished of Taiwanese theater traditions, so that the art of hand-painted film billboards is disappearing. Mo­ri­yama and Yan Jhen-fa, one in the north and one in the south, are two masters still focused on making movie posters into creative works of art, leaving a legacy of local Taiwanese culture that will be remembered at home and abroad.